Meet at the Residents Association Clubroom. Designed by Eric Lyons and built in the 1970s the World's End Estate is a deliberate attempt to overcome many of the issues of previous high-rise developments and eliminate monotonous bland facades through alternative designs and materials. The World’s End Estate is a large monolithic (single-building) housing estate located in the very south of the Royal Borough of Kensington and Chelsea, between the King’s Road and the River Thames. Whilst there are a number of differing tales as to how the estate came to be, the most reliable account is quite simply that the Metropolitan Borough of Chelsea commissioned the design and construction of the World’s End Estate in 1963. Eric Lyons then subsequently produced a design whose housing density exceeded the LCC’s limits of the time. The borough and architect proved quite intransigent, refusing to accept any design that resulted in a reduction in the site’s overall population, and a public enquiry ensued. Ministerial approval for a design providing 750 units of Council housing was finally granted in December 1966. Work began in 1968 when the 11 acres of low rise Victorian housing previously occupying the site was demolished. Construction proper began in December 1969 and, following several breaks in construction, including an infamous builders' strike, eventually completed in April 1977. The first tenants moved in as the works neared their conclusion and the majority of properties on the estate were initially occupied in the period between 1975 and 1977. The estate is currently managed by Kensington & Chelsea TMO on behalf of the Royal Borough of Kensington and Chelsea, who remain the landlord and freeholder. The estate comprises 7 high-rise tower blocks of varying heights interlinked by 9 low-rise walkway blocks in a figure of 8 design with two internal courtyards. All of the buildings abut and merge into each other resulting in what is effectively a single building. The building, as well as the flats within, is of a distinctive many-sided design and the exterior of the building is decorated by exposed plain red-brown bricks. Both features were intended to help minimize the feelings of “brutal monotony”, “regimentation” and “lack of identity” often cited by the residents of many other large housing estates of the time. The many-sided “rippled” design helps ensure that residents can see parts of the building at all times thus helping to engender a feeling of physical security. The same feature also helps relieve the impact of the “crushing scale” of the building when it is viewed from ground level. 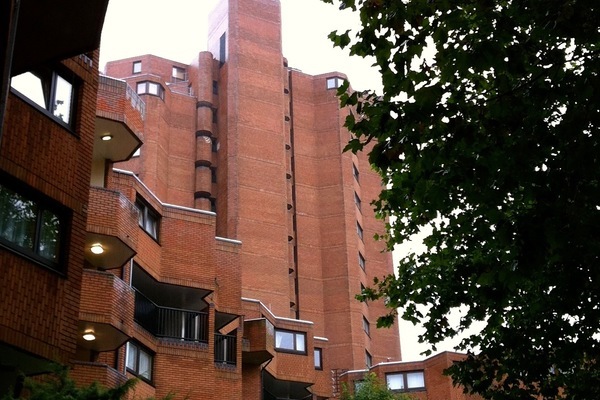 Approximately half of the estate’s flats are located within the 7 tower blocks that contain all of the estate’s two-bedroom properties (typically four flats to a floor) as well as three-bedroom duplex units at the very top of each tower with distinctive turret windows. The other half are located within the interlinking low-rise walkway blocks, a mixture of bedsits, one-bed, three-bed and four-bed units. The facilities provided within the flats were a world away from the Victorian terraced houses they had replaced: a permanent hot water supply and central heating, kitchens designed to accommodate the modern appliances of the time of fridges and washing machines, large living rooms and ample sized bedrooms. Even by modern standards the flats are large. The internal courtyards contain two large garden spaces on the first floor level. These are located directly above the estate’s car parks, which occupy the same space at ground floor level. There is also a significant amount of green space on the south side of the estate towards the river. Immediately adjacent to the estate are located a small number of community facilities that were built at the same time and in the same style. These include the Chelsea Theatre (originally the community centre), Ashburnham Primary School, St. John’s Church (which had previously existed on the site) and Omega House (providing space at ground floor level for that most essential facility, the local supermarket). The north side of the estate faces towards Kings Road and it is here that a small number of commercial units are located at ground floor level with frontages onto the World’s End Piazza and the Kings Road beyond. The tower blocks themselves face in a generally southwesterly direction, thus ensuring that the majority of the residents living within have access to magnificent views of the sunset over west London. It has been argued that the stunning views provided by the tower blocks, as well as the unique and striking outline they pose against the London skyline, more than justify their inclusion in the overall design. When finally finished the completed estate was the subject of much criticism. High-density housing was no longer fashionable and it was easy to criticize a development that suffered from its share of social and behavioural ills, the blame for some of which could justifiably be blamed on the optimistic, if not downright naïve, design of many of its communal areas – an article in the Architects Journal at the time of the estate’s completion noted the fact that many of the communal areas were quite simply “indefensible” and thus often subject to vandalism. 35 years on however and despite many changes by the Council, both wise and unwise, the core design envisioned by Eric Lyons remains in place: seven tower blocks interlinked by “streets in the sky” providing 750 ample-sized and comfortable homes with access to decent local facilities to over 2,500 residents, many of whom have come to love and cherish the estate.